One of the things that has longed fascinated me about Superman is his enormous popularity outside of America. Just recently I learned that the 1951 film Superman and the Mole Men had a cinematic release in Thailand. The images reproduced here are from a Bangkok cinema. It’s a Bird! It’s a Plane! It’s a Positive Symbol of American Power! In the process of bringing my Superman book to print I have had a nagging feeling that something was wrong with the acknowledgments; not so much wrong, but that I had omitted something or someone. At the Society of Cinema and Media Studies conference in Chicago I bought a few new books and as I generally do looked at their acknowledgment sections. In a jet lagged haze last week I finally twigged that in my acknowledgments section I forgot to thank the editorial and production crew at Rutgers. Cue classic Homer, Doh! So thank you and apologies to series editor Corey Creekmur, acquisitions editor Leslie Mitchner, Lisa Boyajian Banning, Carrie Hudak, Jennifer Blanc-Tal, Andrew Katz, Marilyn Campbell, Carrie Hudak, Jeremy Grainger, Brice Hammack, and Sara Henning-Stout. Joe Queenan had a long critical piece in the New York Times Magazine (April 30, 1989). I read this piece and thought it demanded some response. I went to my local comic book shop in Rochester, New York and the store clerk found me the various titles Queenan referenced. May 1989 was the first time I had read a Superman comic in years so perhaps here was the genesis of my Superman book. I’m not so sure that these days I agree completely with my characterization of Wertham. My May 3, 1989 unpublished letter to the New York Times Magazine. I like the way in 1991 I went back to my computer file of letters and made a note. Joe Queenan’s article on comic-books (“Drawing on the Dark Side,” April 30), employs the sensational techniques to catch the readers’ attention that he ascribes to comic-books. Single panels removed from their context, and enlarged several times over, do not convey a sense of the comic-book’s story. Moreover, the illustration used from “Superman” was altered by the addition of the letters DYNA to the stick in the character’s mouth (for the original see Man of Steel No. 3, 1986, p. 12.). [1991 note: In fact Queenan used a version of this particular story printed in a trade paper back, price $12.95, in this version DYNA was on the stick in the character’s mouth but in the original comic book version it was not.] Given the context, a background character says “not Happy Birthday, Not Happy Birthday (a reference to a Warner Brothers animated cartoon) the panel is open to numerous interpretations.] There are numerous other misrepresentations throughout the article. For instance, to depict the “Joker” as simply a “deranged prankster of the 1960’s” who has since become a homicidal maniac is to ignore the “Joker” of the 1940’s and 1950’s who was a lethal killer. Likewise Queenan’s presentation of “Catwoman” and “Green Arrow” downplays the anti-drug and anti-sexual exploitation messages of these comic-books. Incidentally neither of these two comic-books are published under the seal of the Comic Code Authority as the article implies. Queenan warns the comic-book industry that it “seems to be playing with the same fire that nearly destroyed it in the early 1950’s.” That “fire” was not so much the content of the comic-books at the time, but the campaign against them stoked up by Fredric Wertham a New York psychiatrist. Like Wertham, Queenan is worried about the effect of comic-books on children and adolescents and rushes to judge the media without understanding it. Queenan’s elite perspective of comic-books is displayed when he worries about their “pretensions to be more than just popular art” and the attention they have received in the “avant-garde press.” This latter contention is somewhat ironic given the piece on comics (“Comics as Inspiration: Are We Having Fun Yet?”, April 23) that appeared in the New York Times Arts and Leisure Section, hardly avant-garde, the week before. There are substantive issues raised both by and in comic-books, but it requires a better understanding of the media than the elite perspective of Joe Queenan, or the misdirected notions of the late Fredric Wertham, to interpret their content. Perhaps Queenan should read twenty or thirty “X-Men” stories, and even some Roland Barthes, then maybe he will be better placed to discuss comic-books. One of the things I wished I had done over the last 10 years is take a photo of everyone I have seen wearing a Superman T-shirt. 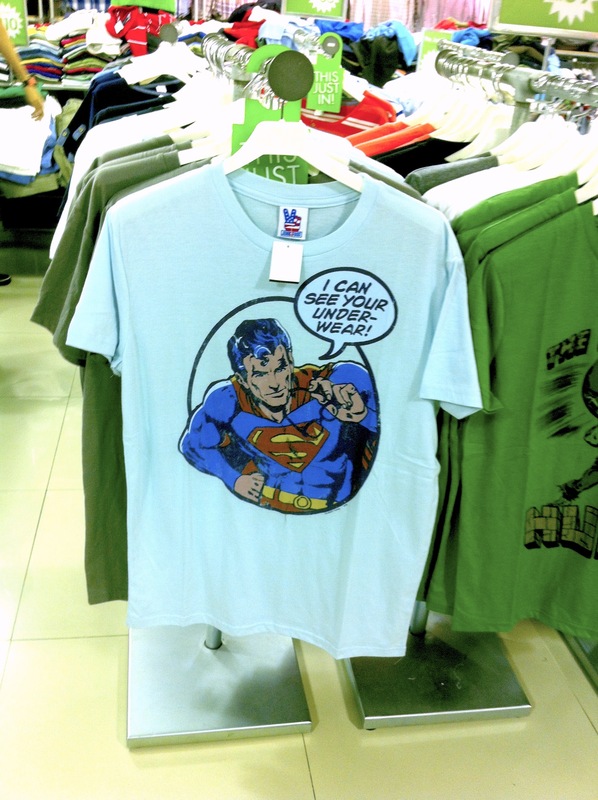 I remember seeing a family of four in Malaysia all wearing the same Superman T-shirt around the time Man of Steel was released. The impact of superhero figures in Singapore and other parts of Southeast Asia is also reasonably large. So for instance the Marina Bay Sands resort in Singapore has a huge DC Super Heroes store and cafe complete with superhero ice cream flavors. 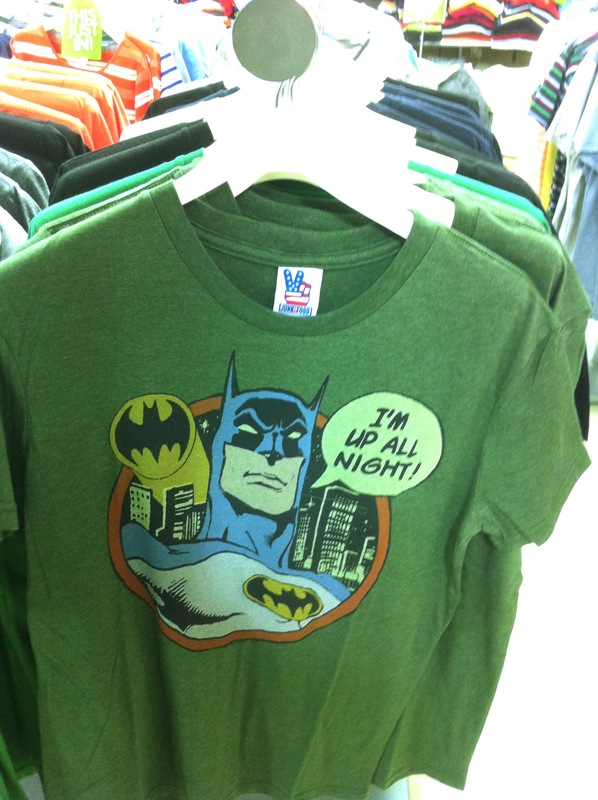 (And if you wonder what the difference between Superhero and Super Hero might be; therein lays a story of trademark law). In 2014 the local subway system issued a series of cards with DC characters including Superman. And Darlie, a popular Asian brand of toothpaste now owned by Colgate-Palmolive, did a similar themed promotion. (If Darlie makes you do a double take look it up and be truly horrified at its past). And of course as Darlie shows commercial western visual representations spread across the world long before superheroes and their ilk. In short Superman is not simply an American icon, but for those outside the country an icon of America. The Superman and Batman logos are highly visible from the street and shine brightly in the evening. 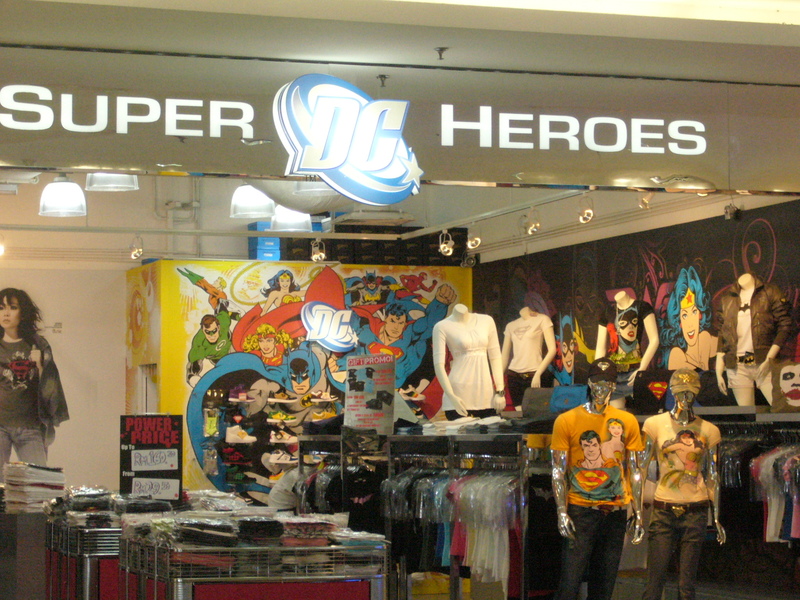 The KL store is not the only DC Comics store in Malaysia or Southeast Asia. 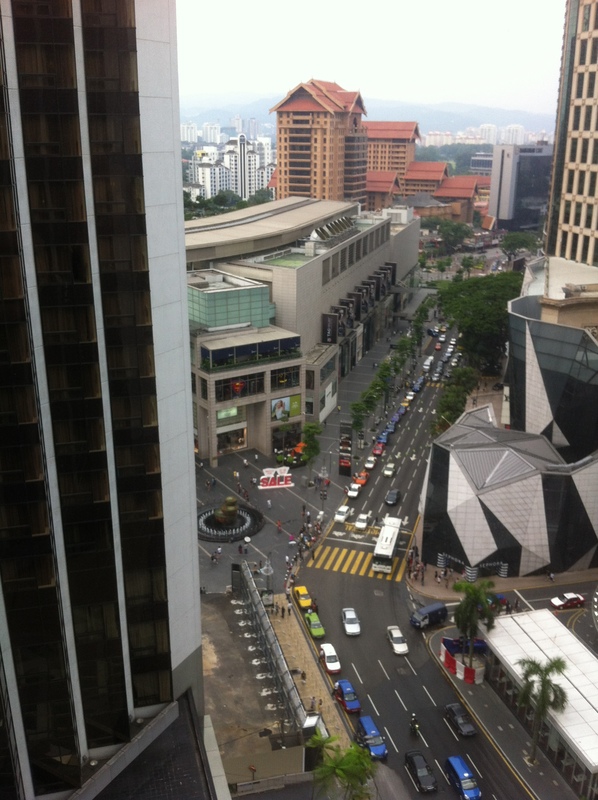 There are stores in Melaka and Singapore. All of these stores are in new or centrally located malls. These stores are somewhat reminiscent of the Warner Bros stores (DC’s parent company) that used to be a ubiquitous presence in American shopping malls before mostly shutting down in 2001. I am not sure how well these stores are doing but the one in Melaka has been there two years at least which suggests some degree of success. There is a story here about the success of American comic book characters in English speaking Southeast Asia. Indeed American comic book movies do well in this part of the world too. 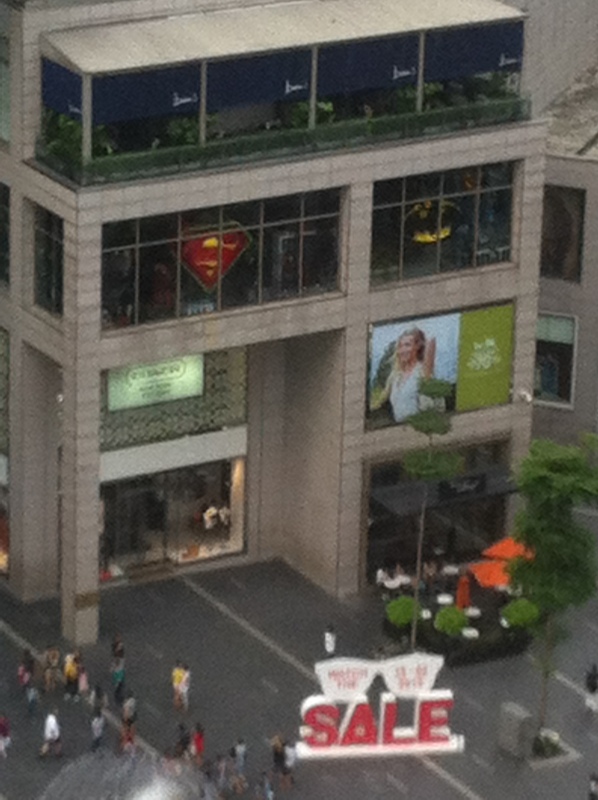 It would seem that the Superman and Batman logos are familiar enough signs that they can be used to draw customers to the KL store. To me these suggest a familiarity with the characters and a playful irreverence. Although labeled as official DC product complete with copyright and trademark registered symbols I doubt these are the sort of products DC would license. I always read the acknowledgments first in scholarly works. Here you find the network of friends, colleagues, and family that stand behind all books. First books generally have pages of these as authors thank everyone who aided them in the process. Inevitably people get left out because of memory lapses. And so here is my page of apologies and extra acknowledgments. First off the two Martins. Martin “The Contrarian, Dirty Dancer” Bazylewich. What was I thinking. The Canadian connection. He taught me the fine art of the trade on fantasy softball and introduced me to Trailer Park Boys. A Saturday Afternoon Recreational Softball stalwart. Here’s to Joe’s Bar! File under necessary diversions. Martin Lund. The other guy with a book on Superman at the moment. We hung out in New York together closed two bars, as in they are now shut, including unfortunately Puck Fair on Lafayette St where one could drink in what felt like a dive bar while looking at the Puck Building and imagining the glory days of print cartoons and comics. File under scholarly discussions. It is not uncommon as an academic to work on a project that ends up going nowhere; at least that is in terms of a publication. Sometimes this can simply be a project that never gets off the ground, a great idea that can not be realized because of time, money, or bad luck. And then there are the times when you complete a piece of work but the project you were contributing to is cancelled. It happens and whether you are the editor of a volume that has the plug pulled, or a contributor to that volume, it is an unpleasant business. I have a general overview piece on Superheroes from 1938-1986 that was contracted for a volume and no longer has a home. So after some deliberation I decided to put it on my academia.edu page. Previously I have posted two conference papers on that site because while they were fine as conference papers I did not have the time, or they did not lend themselves to the process, to shape them into journal articles. Nonetheless one of them received a flurry of views and downloads and may well have been read more than some published articles. Since Superman: The Persistence of an American Icon will be published in just over two weeks this piece might provide some general context for understanding the longevity of Superman. The television series Lois & Clark depicted Lex Luthor in a rather unique manner. When the series ran in the 1990s I always thought of him as somewhat akin to Donald Trump in representation. But for the final version of my book manuscript it occurred to me that Trump has become in public such a a boorish figure and a divisive person, in ways that Lex Luthor would never seek to appear, that I better find a new billionaire as an analogy. Branson’s persona of surface jolliness fit Lois & Clark’s Luthor. So Branson it is. To be clear my analogy is about public personas and not the acts and deeds of either the fictional Luthor, or the very real Donald Trump and Richard Branson.